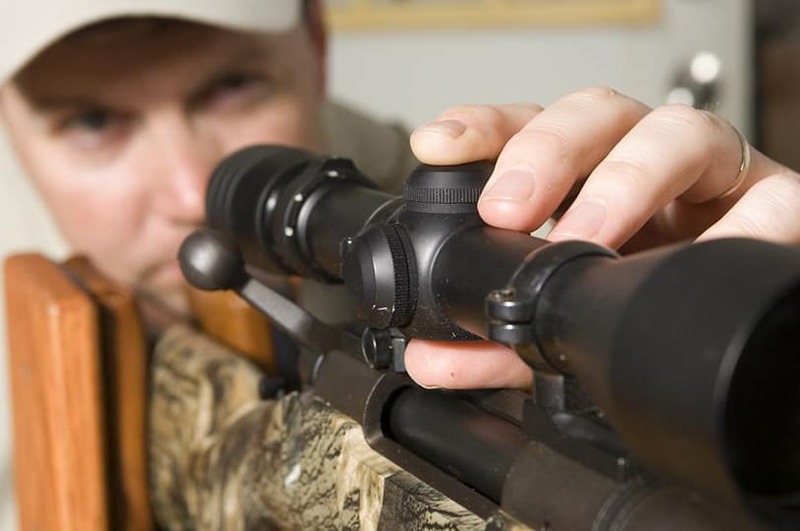 Have you ever wondered how to sight in a rifle scope without shooting? Why would we do this? It’s called bore sighting, and there are a number of reasons why you’d want to do this. Maybe you are not at a proper range or shooting location. Maybe you want to save some money and not spend your ammo on test shots. Maybe you want to minimize your adjustments. Whatever the reason, bore sighting is a quick, easy, and fairly accurate way to sight in your scope. Follow this guide to learn step-by-step how to sight in a rifle scope without shooting. Rifle With Mounted Scope – In order to sight in your scope and rifle, obviously you would want the scope mounted to the rifle and ready to shoot, just as if you were sighting it in by shooting it. The scope cannot be sighted in otherwise. Bulls-eye Target – This type of target is best for this as you will not have any bullet holes as a reference, so you really need the dot on the paper as your guide. You can purchase a target, or draw or print your own. Just as long as it has a dot to zero at it should be good. Range With Approximate Zero Distance – Anytime you are zeroing a scope you want your zero distance to be your target range. Laser Bore sighter – You can do this just by sighting down your barrel, but it’s much more accurate and faster to use a laser bore sighter. It is also cheaper to just look down your barrel, but you can get a decent bore sighting laser for under $50 pretty much anywhere that sells guns or shooting supplies. Rifle Rest – You definitely want your rifle to be stable to get the most accuracy while sighting in. A rifle rest is best to ensure the rifle doesn’t move away from where you originally point it. You won’t have to contend with recoil with this method, but any movement from the rifle will put you off target. A lot of people bore sight by looking through the barrel of their rifle. This method saves time and money and is pretty fool proof. If you’re looking through the barrel you will want to remove the bolt to allow yourself more room to view. However, if you want to be a little bit more accurate, it is worth it to purchase a laser bore sighter. This way you don’t have to get into any awkward positions trying to see down the barrel, you just insert the laser and look for the red dot. You can also pinpoint your reticle to the red dot instead of double checking that the direction matches up eight times. For the sake of this guide, we will be using the laser method. Set your target up at the range you are wanting to zero your rifle in at. Make sure your target has a bulls-eye or aiming point so that you can be zeroing at the exact same spot every time. Secure your rifle in the rifle rest or lead sled. Make sure there’s no play in it and it is totally solid, pointed towards the target. Remove the bolt from the rifle. Insert your laser sighter. Depending on the type you have, it will either fit into the end of the barrel or will load into the chamber just like a bullet. Turn it on and adjust your rifle position so that the laser dot is directly in the center of the bulls-eye. The laser is showing you exactly where the bullet should hit and will be perfectly aligned with your barrel. Many of the load-in lasers will need to be purchased for the specific caliber so they fit very snugly in the rifle. Now all that’s left to do is adjust your scope to match the reticle aiming point to the laser dot on the target. That’s it, your rifle is bore sighted and your scope has been zeroed with firing a shot! Why is it called bore sighting? – Bore sighting is simply aligning your scope reticle with the barrel or the bore. You can scope a target all day long, but the reality is still that the bullet is going to go where the barrel directs it to go. How accurate is bore sighting? – It is pretty accurate. Make sure to sight in at the distance you want to zero at, like 100 yards. Bore sighting does not compensate for human error, drop compensation or anything like that, but it will be on target in most circumstances. Just always make sure to not rely on bore sighting alone. You need to take the rifle out and shoot it yourself to learn how it performs with you. But, with bore sighting before hand, it’s a great place to start and will definitely get your bullet close to fine-tuned. Bore sighting really is not a difficult task and very beneficial for the first sight in before the range. Hopefully, you have found this guide to be easy to follow and have learned how to sight your rifle in without shooting. This really is a great way to get your scope zeroed fairly accurately when you are not close to a range or are in a firearms discharge restricted area. As always, this method does not completely replace the need for taking your rifle to the range for an actual sight in, but it does get you pretty close and saves time and money by allowing you to not have to waste a bunch of rounds if you are very far off of zero. Happy shooting! Hi!, I'm Wesley. I created Gun Goals to share my passion of firearms with others. My goal is to help educate more people on the topic and show everyone they're something everyone should learn about. About me.